The Minnesota Timberwolves own the No. 20 overall pick in the 2018 NBA draft. Who will still be on the board and could be a target for the Wolves? We've compiled a list of 11 potential picks (in alphabetical order) with biographical information supplied by STATS. The NBA is becoming increasingly positionless, and that's a good thing for Bates-Diop's future. Where does he fit? It's tough to say, but the Big Ten player of the year figures to find a spot somewhere even if there's not one thing he does at an elite level. Becoming the best player in one of the nation's best conferences was a surprise in and of itself, particularly after Bates-Diop went down with a stress fracture in his left leg just nine games into his junior season. He's a solid shooter with a high release point that allows him to get his shot off against most defenders, and he's very adept using floaters and runners in the mid-tier game. He has a post-up game and the moves to back it up, and can finish at the rim with either hand. He doesn't have great lateral quickness but is long enough to serve as a rim protector who knows when to help from the weak side. All of that sounds good, but it's still tough to find a spot for Bates-Diop. Despite the reach, he's not strong enough to defend most power forwards and centers and lacks the quickness to defend many smaller players. Creating his own shot won't be easy for Bates-Diop in the NBA, so he'll have to become a good spot-up shooter who can occasionally take the ball in the post. He's a potential mid first-round pick who could thrive under the right tutelage, and while it's hard to see Bates-Diop becoming a star, it's equally difficult to imagine him not becoming a rotation player. Few players helped themselves more in the eyes of NBA scouts with one game than DiVincenzo did with his brilliant performance in Villanova's national championship victory over Michigan in April. The redshirt sophomore scored 31 points on 10-of-15 shooting in the 79-62 win while showing off his athleticism, explosiveness and ability to play the point. It was uncertain whether DiVincenzo would leave the Wildcats with two years of eligibility remaining, but an outstanding performance in the combine guaranteed he would enter the draft as a likely first-round pick. Despite only starting 10 of 40 games this season for Villanova, DiVincenzo still averaged 13.4 points, 4.8 rebounds and 3.5 assists. He also shot 48.1 percent from the field and 40.1 percent from 3-point range en route to being named Big East Sixth Man of the Year. If doubts remained whether DiVincenzo was just a one-game wonder, his showing at the combine likely quieted that criticism. He had a combine-best standing vertical lead of 34.5 inches, tied for the top max vertical leap at 42 inches, finished fifth in the agility drill and also looked very comfortable when competing in the five-on-five scrimmages. DiVincenzo is a well-rounded player that is NBA-ready in terms of his shooting, athleticism and toughness, but the team that selects him will have to determine whether he profiles best as a point guard or shooting guard. Still an unsure first-round pick after his national championship performance, DiVincenzo's showing at the combine almost assuredly will be enough to move him into the top 30. 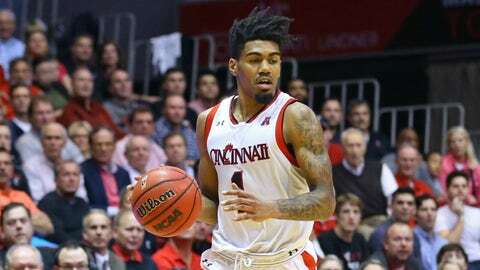 Evans may have been Cincinnati's leading scorer in each of the last two seasons, but his ability to also be a major contributor on the defensive end could make him a late first-round selection. Evans left the Bearcats after a junior season in which he averaged 13.0 points with career highs of 4.7 rebounds and 3.1 assists. That came after he put up 13.5 points, 4.2 boards and 2.7 assists per game in 2016-17. While his scoring basically stayed the same during those two seasons, Evans' shooting numbers fell off in 2017-18. His overall field-goal percentage went from 47.3 to 42.7 and his 3-point percentage dropped from 41.8 to 37.0. Evans has some work to do in order to become a consistent offensive threat, but he adds to his overall value by being an above-average defensive player. Evans averaged 1.3 steals in each of the last two seasons - ranking in the top 10 in the American Athletic Conference each time - and blocked 1.0 shots per game as a junior to rank second in the AAC in that category among players 6-foot-6 or shorter. Evans appeared in all 105 of Cincinnati's games since 2015-16, starting each of the past 77 contests. The program compiled an 83-22 record over that stretch but went just 2-3 in the NCAA Tournament. Evans, though, shined in those five games with averages of 15.4 points, 6.6 rebounds and 2.0 assists, showing he has what it takes to develop into a solid two-way player that NBA teams covet. 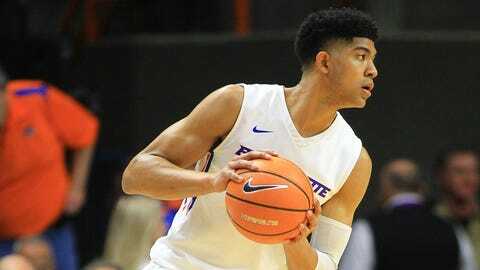 Hutchison played but did little in his first two seasons at Boise State, then overhauled his shooting form and became a big contributor for the Broncos as a junior and senior. He has perfect size to be an effective defender at the next level, with a 7-foot-1 wingspan that should help him keep players in front of him and get in passing lanes. Hutchison is a solid athlete who made himself into a good driver thanks to an array of spin moves and crafty footwork. He's effective moving off the ball and knows when to make the right cuts and where to go in transition. Hutchison lacks a great first step and won't be someone who blows by defenders, and despite the improvement in his shooting mechanics, he still has trouble with his accuracy off the dribble. Even if he becomes more of a spot-up shooter at that end of the floor, NBA teams are impressed with what they think he can become. Hutchison pulled out of participating in events at the NBA draft combine because of an apparent promise, with ESPN reporting that he received assurances on a "safe landing spot" from a team picking between 20 and 30. Another report suggested that the Bulls, with the No. 22 pick, were the team with its eye on Hutchison, who should be able to step right in and contribute as a rookie. Not heavily touted coming out of high school, De'Anthony Melton put together an impressive season as a freshman at USC in 2016-17. He was unable to gain another year of college experience, however, as the NCAA ruled him ineligible as part of the pay-for-play scandal that rocked the sport. Denied a chance to play, he spent the past season practicing with the Trojans and by mid-January turned his attention to focusing on the draft. He was somewhat of a jack-of-all trades in his one college season, averaging 8.3 points, 4.7 rebounds, 3.5 assists, 1.9 steals and 1.03 blocks. An adept ball-handler, he displayed solid court vision and has a high basketball IQ. His major knock on offense was his subpar shooting - he made just 28.4 percent of his 74 3-pointers. At the draft combine, however, he had an encouraging performance and didn't show much rust, finishing a 5-on-5 scrimmage with 15 points on 5-of-8 shooting, to go with five rebounds, three assists, three steals and two blocks. His defense was always a strength in college, and he should be able to help out immediately in that department at the next level, playing a physical brand of basketball for his size while rarely finding himself out of position. 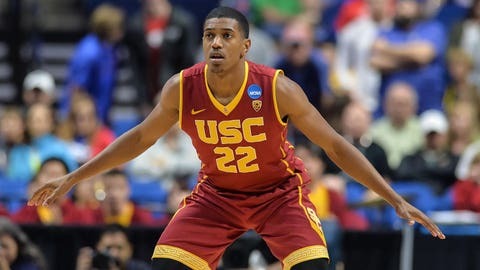 Despite not playing in any meaningful games in over a year, Melton appears to be the total package as a two-way combo guard and is expected to be drafted before the end of the first round. It comes as no surprise that Simons is one of the least known players available in this draft since he didn't attend college and instead spent the 2017-18 season at IMG Academy in Florida. Similar to the path that Milwaukee's Thon Maker took to the NBA, Simons is eligible because he will turn 19 before the draft and will have already been out of high school for a year by June. He originally committed to Louisville but decommitted in September in the wake of Rick Pitino's ouster before eventually deciding to go pro. Although Simons remains something of a mystery, he's a very intriguing prospect due to his combination of youth, athleticism and ability to create offense off the dribble. Simons doesn't have prototypical shooting guard size and will need to improve his decision making before he can run an NBA offense. Still, he's an outstanding athlete and profiles as a big-time scorer with good range on his jumper and solid ball-handling skills. As arguably the least NBA-ready player in the draft, Simons isn't going to make much of an impact as a rookie so he can instead focus on adding weight and strength to a very thin frame. There's really no aspect of his game that is terrible, but he's still very raw and will need time to develop in order to reach his full potential. Perhaps the best thing for Simons would be to spend some time in the G League as a rookie where he can mature both physically and mentally. 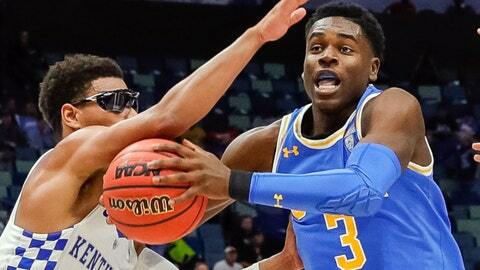 There's little doubt a team will take a chance on Simons in the back half of the first round. 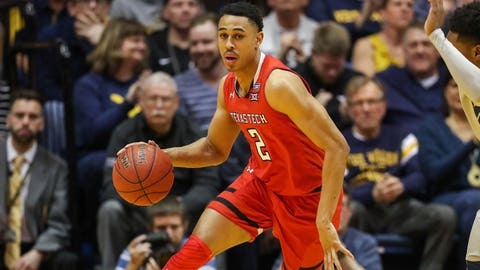 Smith wasn't a top recruit in high school, a three-star player who turned into much more for a Texas Tech team that was ranked as high as sixth in the AP Top 25 and made a run to the Elite Eight. Smith is an elite athlete with incredible hops who made his mark on the defensive end both in terms of keeping his man in front of him and helping away from the ball. He's versatile enough that he can guard at least three positions thanks to his lateral quickness, and he's an excellent rebounder for his size due to his leaping ability. Smith has a high basketball IQ that comes in handy on the offensive end off the ball - he'll cut at the right time and time his jump to help him get putbacks at the rim. He's not a great ball-handler, and this is a key area to watch in terms of his development. If that improves, he'll be able to get to the basket and create his own shot. Without it, he'll likely be limited to a 3-and-D wing. He shot 45 percent from 3-point range in college but only attempted 40 3s, perhaps due to a lack of confidence in what could generously be described as an awkward shooting motion. The mold is impressive with Smith, and there's potential for him to grow into a true two-way player. But there are enough concerns about his offensive upside that Smith figures to go outside the lottery, likely somewhere in the late teens. 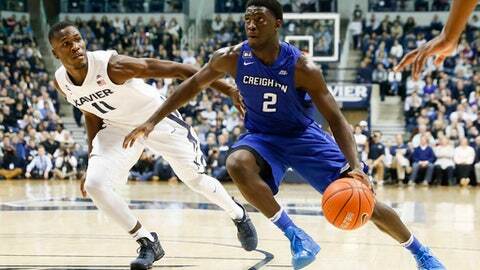 Thomas gave up his final season of eligibility to enter the draft after another season of improvement at Creighton. He averaged 15.1 points, 4.4 rebounds and 2.8 assists while shooting 53.8 percent from the field and 41.1 percent from 3-point range to earn second team All-Big East honors. Thomas made an even bigger impact on the other end as a lockdown defender, capturing the conference's Defensive Player of the Year award after sharing the honor in 2016-17. He's just the 10th player in Big East history to win the recognition more than once. Thomas isn't the type of player to appear on highlights often or light up the scoreboard, but he's a solid two-way wing with the ability to shut down an opponent, play multiple positions and hit shots from most anywhere on the court. Those players are always in demand in the NBA, even if he's not a pure point guard. There's little doubt that Thomas can play the point and be a solid contributor, but he isn't particularly great at creating shots for others and isn't very aggressive taking the ball to the basket and drawing contact. Any offensive shortcomings can be forgiven because Thomas sets himself apart as a defender. He has excellent length even at 6-foot-3, and is versatile enough to guard NBA point guards and bigger wings. Add to that an intense competitor who is relentless in every facet, and Thomas has all the pieces in place to be a defensive stopper at the next level. Thomas projects as a valuable rotation player and clearly is a first-round pick in a relatively weak guard draft. As the son of nine-year NBA veteran Gary Trent, Trent Jr. certainly has the pedigree and leadership to attract next-level scouts. The 6-foot-6 guard also appears to have the 3-point shooting ability, poise and toughness to make a difference on the offensive end. Trent showed he can fill it up from long range during his only season at Duke, sinking at least four 3-pointers in 11 games and ending up third in the ACC with a freshman program-record 97 3s overall. Coach Mike Krzyzewski called him "the best 3-point shooter in the ACC." 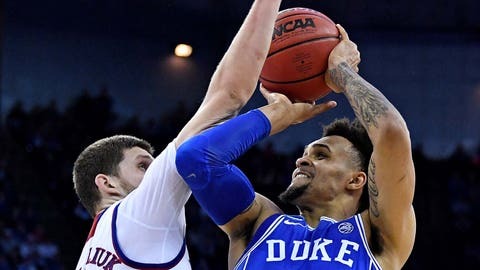 He shot 40.2 percent from beyond the arc and made several big shots late in games, though he went a combined 4 for 18 from 3 against Syracuse and Kansas in the Blue Devils' last two NCAA Tournament games. Trent boosted his profile at the NBA draft combine as he finished with a game-high 22 points with 3 3-pointers in the scrimmage setting and posted a surprising 33.5-inch standing vertical jump. Trent isn't considered very athletic or explosive and doesn't have a quick first step, but he's able to use his physical frame to rebound and score inside. 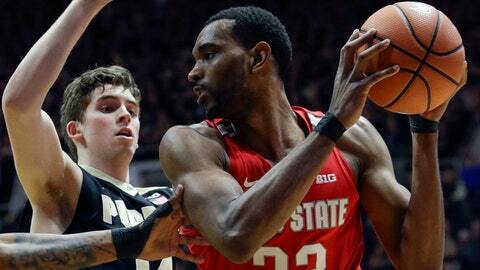 While the effort is there defensively, Trent may struggle against quicker guards at the pro level. Because of his bloodlines and shooting ability, Trent is likely to be selected in the mid-to-late first round. 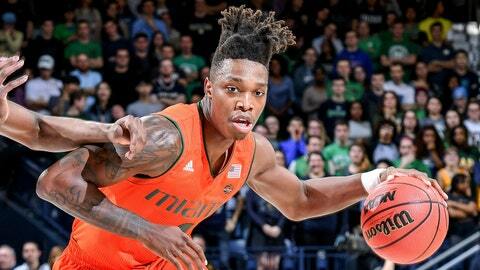 After a slow start with Miami, Walker seemed to come of age down the stretch in his freshman season. The 19-year-old felt strong enough about his performance after averaging 14.5 points over his last 17 games that he decided to take his talents to the next level. 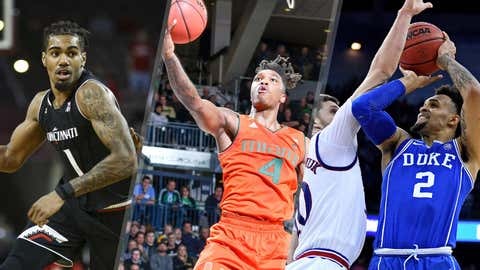 NBA teams seemed convinced he made the right call at the draft combine as Walker finished in the top 10 in all three speed categories and among the top 15 in the two jumping events. Walker reportedly also shined off the court, performing well in team interviews by all accounts. Scouts believe Walker has the ability to improve his long-range shooting - he shot 37.1 percent from 3-point range in his last 16 games at Miami - by making an adjustment to his form. 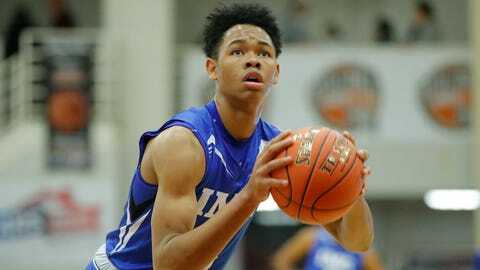 Walker has solid ballhandling skills, can take defenders off the dribble and also has a solid frame that should be able to handle physical NBA play. However, some feel that he can tend to become disinterested when he doesn't have the ball. Walker may have some work to do defensively as well, as he's perceived to lack intensity and focus at times. Still, Walker appears to have all the tools necessary to succeed, leaving him likely to be selected in the back end of the first round.